Immediately after Trump’s withdrawal from the JCPOA on Tuesday, Israeli officials began accusing Iran of positioning its forces in preparation for an attack. The alleged activity was cited as a justification for a new round of airstrikes on Syria targeting a military base in Kisweh. An hours-long exchange of fire between the Israeli military and alleged rocket-equipped Iranian Revolutionary Guard Corps (IRGC) personnel seized the world’s attention early Thursday morning just after midnight, fanning fears that the Middle East is once again being plunged into a major new war pitting the settler-colonial state against its bitter rival, the Islamic Republic of Iran. While certain media outlets and Western capitals have supportively characterized the Israeli role in the incident as the result of an Iranian “provocation,” the Israelis have spent years persistently stoking a conflict with Syria and Iran through their backing for anti-government insurgents, while also reserving the right to carry out unprovoked attacks on targets in Syria assumed to be associated with Iran. According to military sources in Tel Aviv, Iran had begun positioning weaponry and personnel in preparation for an attack on Israeli occupation targets in the illegally-occupied Golan Heights just hours after U.S. President Donald Trump withdrew from the 2015 six-party Joint Comprehensive Plan of Action (JCPOA) with Iran. Occupation spokesperson Lt. Col. Jonathan Conricus accused Iran of firing approximately 20 Grad and Fajr rockets at Israeli military bases in the Golan, adding that most of the rockets were either intercepted by the Iron Dome aerial defense system or simply landed in Syria-controlled territory. However, Beirut-based Al-Mayadeen claims that around 50 missiles were fired from within Syria at Israeli forces stationed in the Golan Heights, targeting 10 Israeli positions and sending Israeli civilians fleeing for their shelters. Following the salvos, Israeli occupation forces unleashed a torrent of missiles at targets within Syria, claiming to hit dozens of alleged Iranian military compounds and the logistics headquarters of the Quds Force, the external operations unit of the IRGC. According to the Syrian Army General Command, a large portion of these missiles were downed, though three people were killed and two were injured while an ammunition depot and radar station were destroyed. The Israeli military pinned the blame for the attack from Syria on the Quds Force commander without citing any evidence. “It was ordered and commanded by Qassem Soleimani and it has not achieved its purpose,” an Israeli spokesman said. The Russian Defense Ministry confirmed that Iranian armed groups and Syrian Arab Army air defense units had come under fire in Southern Syria by over 70 air-to-surface and tactical missiles, over half of which were intercepted by the Syrian air defense. “Participating in the air raid were 28 Israeli planes F-15 and F-16, which fired more than 60 air-to-surface missiles on different parts of Syria. Also Israel launched more than ten tactical surface-to-surface missiles,” the Russian Defense Ministry said. The exchange of fire is the largest military engagement between Syria and the Israelis since the 1973 October War, when a coalition of Arab nations unsuccessfully fought to take back territories occupied by the Israelis. Israeli occupation forces had seized the 500 square-mile Golan plateau from Syria during an expansionist military campaign of 1967, prior to annexing it in a move that remains unrecognized by the international community, with the exception of Tel Aviv’s benefactors in Washington. While the Israeli military claims that it doesn’t seek further escalation, the attack comes on the tail of dozens of airstrikes on Syria in recent years. The Israelis have also provided weapons, cash, and material aid to anti-government militias near the illegally-held Golan. As recently as Monday, Lieberman had promised to assassinate or “liquidate” Syrian President Bashar al-Assad and “topple his regime” if he allowed the Iranians to retaliate in response to the Israeli attacks. In response to repeated provocations, Iran has shown a remarkable amount of restraint. Tehran’s patience reached its end last month when Israeli jets fired eight missiles at the T-4 airbase in Homs, killing several Iranians including Colonel Mehdi Dehghan, a top officer in Iran’s unmanned aerial vehicle program. Following the attack, Iranian officials vowed to strike back. According to London-based war monitor the Syrian Observatory for Human Rights, 23 people including five Syrian soldiers were killed in the attack; however, forces aligned with the Syrian government claim that no one was killed. Syria’s Foreign Ministry described the Israeli attacks as the start of a “new phase” in the conflict with the “Zionist entity,” noting that the Israelis’ “direct aggression” against Syria is a result of Tel Aviv’s frustration with the failure of its anti-Damascus opposition proxies. “This aggressive conduct by the Zionist entity … will lead to nothing but an increase in tensions in the region,” an official at the ministry said, according to Syrian news agency SANA. While the Israelis are patting themselves on the back for humbling the alleged Iranian military presence in Syria, the airstrikes are unlikely to turn the tide or significantly alter the balance of forces in the Syrian conflict — which is near its final days, as Syrian government forces and allied fighters clear the remaining pockets of foreign-backed anti-government rebels. 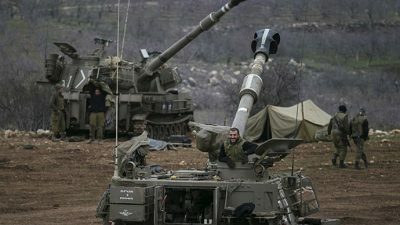 The attack is also unlikely to significantly deter Iran or its allies from establishing a presence on the border with the Israeli-occupied Golan Heights, feeding continued Israeli anxiety about the continued strengthening of resistance forces in the region.